Testing a circuit to make sure the power is off is a critical step in any DIY home electrical wiring project. A simple voltage tester can be used to confirm this. However, there are many, many different types of voltage testers available in the marketplace, and they vary in both price and complexity. In this video, Terry Peterman, the Internet Electrician, reviews different types of voltage testers and how they function. This video is just a short intro into the different types of voltage testers on the market. A more in depth article on voltage testers is also posted on the site. Plus, be sure to review the video demonstrating how to test a circuit to make sure the power is off. 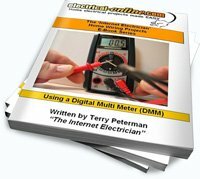 Watch the site for a soon to be released video and e-book which will cover everything you need to know – and more – about voltage and circuit testers of every type and sort, including a thorough explanation of digital multi meters, how to understand them, and their different applications. This entry was posted in Meters & Testers, Tools-Videos, Videos and tagged circuit, digital multi meter, diy, volt, voltage tester, voltage testers. Bookmark the permalink.